In his new book ‘Down to Earth’ Monty Don has commented: “You don’t have to use a machine – scythes cut grass very well.” This observation has sparked a surprisingly reactionary response from fellow gardening correspondents and garden machinery representatives. Monty’s assertion that scythes cut grass very well is factually true; it is indeed quite possible to mow a lawn with a scythe. Monty and many other British scythe users have rediscovered the pleasure of this for themselves in recent years. In parts of Europe a scythe is still the default tool for managing domestic grass. There is indeed a choice that does not involve the use of machines or fossil fuels. Can a scythe mow a lawn as well as a lawn mower? Well the answer to this depends in part on what you would like to get from your lawn. To create an actual bowling green or a croquet lawn as a playing surface with a cut height of 10mm or less requires a huge investment in inputs and ongoing maintenance including mowing on a daily basis. A scythe is not suited to this task (but then neither are most domestic lawn mowers). For most garden lawns what most people want is ground cover that is green, soft and welcoming. It needs to be moderately resilient and not onerous to maintain. If you can let yourself take a more relaxed approach to lawn maintenance you will be rewarded: raise the cutting height so the grass is less stressed, let go of any notions of keeping up with the Jones’s regular stripes, and be laid back about your mowing schedule to encourage daisies, selfheal, cowslips and other wild flowers to grow and flower. This relaxed lawn maintenance approach is generally straight forward with a rotary mower but cylinder mowers (particularly the push variety) will struggle with longer grass should you miss a cut or two because of wet weather, whilst you are away on holiday, or after letting flowers bloom. 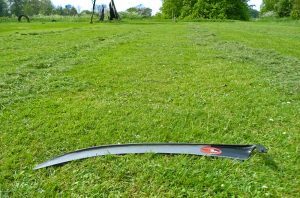 A scythe is a useful tool for trimming back overgrown lawns; in this context, it makes a perfect partner to a hand pushed cylinder mower if you want to combine the best of both tools without an engine. National Lawnmower Museum curator Brian Radam is quoted in the Daily Mail as saying: “Scything is a backbreaking job”. Scythes have been developed and refined over their almost 2000 year history into a remarkably ergonomic tool. Properly set up and used they are good exercise for all parts of the body, including the back and core muscles. Scythe use actually avoids health issues associated with petrol machines (particularly strimmers) such as hearing loss, white finger from vibration, musculoskeletal damage from bad posture and lifting. The idea that the invention of the heavy cast iron lawn push mower by Edwin Budding in 1830 was to make life easier for servants is unlikely. The landed gentry would only be interested in being the first to employ the latest no doubt expensive gadget so they could produce even more show off lawns with stripes around their mansions. Mowing lawns with a scythe is a particular pleasure requiring very little physical effort as lawn grass is short, light-weight, soft and mows sweetly. So the comment “Many of those gardeners who would have time for this would be of an age when they shouldn’t really be swinging scythes around!” is way off the mark. There are a significant number of folk in their retirement enthusiastically learning to scythe and keeping themselves fit and active as a result. “A scythe does not cut grass very well, because it cuts properly only if the grass is standing up straight – not lying down after rain, as it mostly does”. On this she has got it completely the wrong way around. A scythe cuts best when the grass is wet or still has dew on it. It is lawnmowers that struggle with wet, overgrown lawns. A scythe is ideal for dealing with overgrown lawns following a period of wet weather or when you have been away on holiday. Mary also says “Even on dry days, a scythe needs to be razor sharp, or it tears the grass, leaving split ends like a bad haircut”. Absolutely, a scythe blade needs to be razor sharp at all times, and would be given a few seconds of sharpening every 5 minutes or so during use to keep it this way. It is badly set or maintained lawnmowers that produce split ends in lawns. Plant breeders have even selected ‘stringless’ lawn varieties to reduce this very problem. Most domestic lawn mowers and strimmers are rarely, if ever, sharpened; they rely on brute rotary speed to sever grass blades. The bruising from these blunt instruments can cause unsightly straw-coloured die-back at the tips of grass leaves. Bruised machine cut grass clippings ferment within an hour of mowing so are not safe to feed to pets, where clean cut scythed grass would be. Mashed compacted mower clippings are also more difficult to manage in the compost heap. Mary concludes “I also defy anyone to cut a lawn much lower than three inches with Monty’s dangerous weapon”. Used correctly, scythes always cut lower than three inches. Mary Keen describes scythes like Monty’s dangerous weapon as “huge and lethal” – really Mary! Alarmingly in the Daily Mail, British Lawnmower Museum curator Brian Radam also “warned that having a large blade lying around would not be safe among young families”. 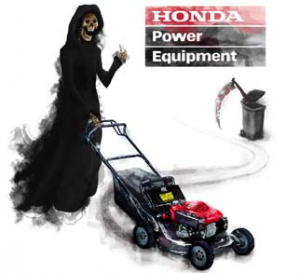 Powered lawn mowers and strimmers are responsible for more injuries than terrorism; ranging from eye injuries from flung stones and debris, to severed fingers and toes, and even death. U.S. Consumer Product Safety Commission statistics (2015) are shocking: each year 75 people are killed, and 20,000 injured; one in five deaths involves a child. Each year, 800 children are run over by ride-on mowers or small tractors and more than 600 of those incidents result in amputation. Scythes are very safe to mow with, and on a soft clean lawn it is quite safe and pleasant to mow in bare feet. In common with other sharp edge tools,and regular kitchen knives, scythe blades of course need to be handled and stored with respect; accidental mishandling can result in minor cuts. The British Agricultural and Garden Machinery Association have even joined in to express their concerns as in 2016 sales of mowers are estimated to have been worth more than £250 million in total, with volumes in the region of 36,400 petrol ride-ons, more than 340,000 petrol pedestrian units and some 1.22 million electric units, including robot mowers. They have nothing to fear however as few people, including Monty, are suggesting that scythes will replace mowers or other garden tools, or even that they are necessarily better for lawns. Simply put, scythes are a worthy addition to the garden tool shed. They are the best tool for mowing wild flower meadows and long grass, but are also handy for a range of other tasks from topping lawns to trimming weeds and areas around allotments and fruit beds. Beyond the simple practical usefulness of the scythe as tool to mow grass, it is the unexpected pleasure people get from using a scythe well which grabs them, and which inspires writers from Monty Don to Tolstoy to enthusiastically extol the virtue and joy of the scythe. This entry was posted in About Scything, TV film and press, Uncategorised and tagged lawn, Monty Don, scythe. Bookmark the permalink. Suppose a spade isn’t much use these days with mini diggers and the like!!!!!! And loppers are no good for pruning if you’ve got a flail trimmer! Fantastic tool! 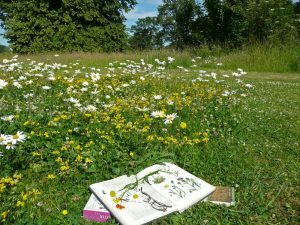 I have been using the beautifully balanced and lightweight Austrian scythe for over ten years on two meadows and can achieve superb results. I watched a farm tractor take 20 minutes trying to trim the last bit of grass round a barn when I could have done it in five minutes with the hand scythe – all that effort: like trying to trim a moustache with hedge shears; all that noise, toxic emissions, and waste of diesel and time.